Welcome to Twisting With The 60's Batik blog hop. Such fun and so many memories. I have been humming and grooving for days. We have been well led by Madame Samm (Sew We Quilt) and her cheerleader Mary (1 Piece 2-Mary) as they drive their Love Bug filled with Flower Children in search of Island Batik and their lovely fabrics. Flowers, tie-dyed fabrics and peace symbols define the era without words. I am now the proud owner of a flower pincushion. I am sure the 60's would assume a Mug Rug could be something for feet but mine will come in useful when I am stitching. As will the sewing caddy. One wonderful legacy of the Hippie movement is the Peace symbol. It has stood the test of time. I just might be considered Cool in my necklace created from Yo-yo's stitched in batik fabric. When I started this my intention was a cheerful tie-dyed Dresden Plate Flower for a little table centerpiece. But it grew and became more cheerful. It kept growing and might still get another border. It is difficult to choose border fabric because I used bright, not perfectly matching colors together. A Flower Child quilt for sure. Should become a nice lap quilt. I began another Batik project but time intervened. The fabrics were too beautiful not to show you. This has good vibrations and will not remain on the UFO list too long. Thank you for visiting the quilting caravan. Sew climb aboard the Love Bug , pour a cuppa tea and join the other Flower Children. Love your flower power projects! Thank you for sharing. I kept grinning when I was reading: it kept on growing and growing..... :-)) It will be a king bed size at the end :-) I like your dresdren flowers and the fabrics! I love your Dresden Plate flower quilt. So bright & cheery! I am soooo impressed with all the love that your poured into your groovy projects..oh my indeed! Your dresden flower power is beautiful Frances! Great projects! The yo-yo necklace is really nice. That necklace is so fun. Peace! Great projects. I love all your projects. Thank you for sharing your bright dresdens. So many creations, and they were all perfect! What great projects, love your dresdens! Beautiful work! Love all your projects. Your Dresden plates are fabulous!! Thanks for sharing your cute projects. You were certainly busy and they're all just beautiful! Love all of your projects, but that sewing caddy is my favorite! Love the fabrics! Well done! I have seen that love print recently around here. We used it for backing on a donation quilt and one of the gals was practicing her free motion on that quilt. Love the dresden plates in brights! That dresden plate quilt is fantastic! Love all of your projects! Beautiful Dresden flower power quilt! The mug rug and sewing caddy are just too cool, too! Frances, your dresden is gorgeous. All your projects are so much fun! Thank you so much for being part of this fun hop. Wow I can really dig all those groovy creations! I love your creations! Especially the dresden one! Love the pin cushion too. Amazing work! You've got quite the nice collection of batik projects! They are all stunning but I am in mug rug mode lately and the shape of yours really caught my eye...it appears to be a diamond with the tips cut off. Lovely and unique. I loved your colorful dresdens and the pincushion. Lovely work, Frances. The 60's was a very unique time. You captured it well. Beautiful. I just lo e the Batiks, they turn everything completely into another class. Thanks for Sharing. You do lovely work. I love your bedspread or lap quilt to be. Fantastic! Love the colors too. Beautiful! The Dresden Plates are just gorgeous. I really like them. They will make a beautiful quilt. Thank you for sharing. 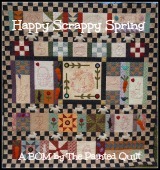 Great peaceful fabrics you've used, beautiful work. Hi friend.... can it be lovely.... and powerful...??? Yes indeed! I LOVE each one of your projects! You are so creative! Well done. Your projects are very colorful and beautiful. You're very creative and Peace always. Great dresdens!! Thanks for sharing with us. I absolutely love Dresdens, so your quilt is right up my alley. Looks very pretty! Very lovely. I love your rainbow of colors. I love all your projects. Those dresdens are really pretty. All of your projects are great. Love the dresdens. Absolutely amazing projects! I love the stroll down memory lane as you displayed your projects. The fabrics you chose are beautiful. I adore how your Dresdens expanded and expanded. They are beautiful. Thanks for participating and sharing your amazing creativity. Wow! Such a lot of fabulous color in your projects. Love it all. And that quilt that just grew and grew - made with some of my all-time favorite blocks, Dresdens. Wow (I think I said that). Thanks for sharing all that beauty. Sweet projects, sew 60's! Thanks for sharing! Loooove ALL your projects...but the Dresden's are my Favorite!! AWESOME job!! I got some great vibrations from your twistin' projects. Peace, flower child, love...it was a happenin' time and good for changing the world as it was. Groovey projects - love the pincushion and all those gorgeous batiks you used. Such very cute stuff. The Dresdens are the best. Love those colors. All your projects are fantastic! That Dresden quilt is too beautiful! Fantastic job! Love how the dresdens are halved at the edges of the quilt. Also love the mauves.